Instructor User Guide MailtoolHow do I send a Mailtool message? Select the Mailtool tool from the Tool Menu of your site. 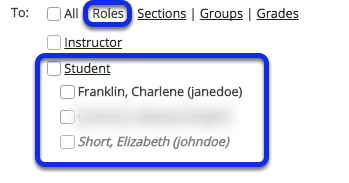 When you compose a message in the Mailtool, you have the option to select recipients in the course by role, section, or group. You may also add other recipients who are not enrolled in the course. Click to place a check mark next to All to send an email to everyone in the site. 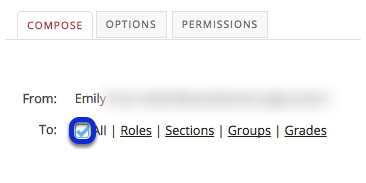 Click the Roles link to expand the list of roles within the site. You may also click on the link for a role (e.g. Student) to expand the list and show individual users. Place a check mark next to the roles and/or individual recipients you would like to address in your message. Click the Sections link to expand the list of existing sections within the site. You may also click on the link for a section (e.g. Lab1) to expand the list and show individual users in that section. Place a check mark next to the sections you would like to address in your message. Click the Groups link to expand the list of existing groups within the site. You may also click on the link for a group (e.g. Team-1) to expand the list and show individual users in that group. Place a check mark next to the groups you would like to address in your message. Enter the email address for unenrolled user/s. To send a message to a user who is not enrolled in the site, select the Other Recipients link and then enter the email address or addresses (separated by commas) into the text area provided. Zoom: Enter a subject line. Give your email message a subject. Click the Attach a file link if you would like to browse for and attach a file to your email. 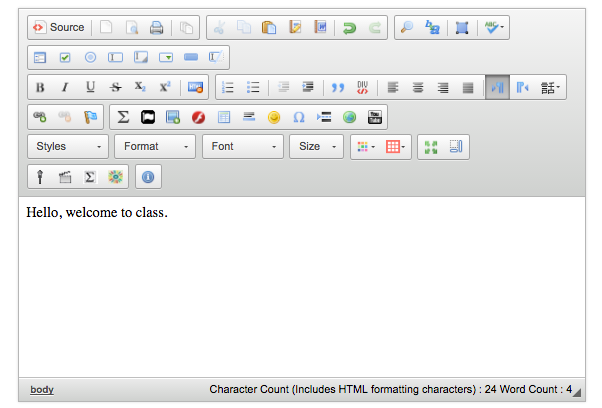 Use the Rich Text Editor to compose your message. If you would like to be copied on the email message, click the box next to Send me a copy. If you would like the email message to be added to the course Email Archive, click the box next to Add to Email Archive, visible to all site participants. Note: This option only appears if the Email Archive tool is active in your site. If you would like recipients to see the users copied on the message, select this option to include the recipient list in the message. The message will be sent using your external email address as specified for your user account in the system. Prev: What is the Mailtool tool? Next: How to I set the Email tool options for my site?